Jackson Pollock’s poured paintings are estimated to be worth up to $500M each, making them the world’s most valued paintings. There are also 350 fakes in circulation. Can you tell the masterwork from the fake (above)? We are quantifying Pollock’s fractals using a computer analysis technique called Dimensional Interplay Analysis with the aim of contributing to the authenticity process. The accuracy depends on factors such as image quality of the paintings, the techniques used to process the images and the fractal parameters analyzed. The most recent studies from 2015 achieved 93% accuracy. 2004-5: Physicist Jonas Mureika’s group quantified Pollock’s fractals using a multi-fractal analysis technique (Physical Review E, vol. 72, 046101-1-15, 2005 and Chaos, vol. 15, 043702-1-6, 2005). 2006: Physicist Kate Jones-Smith and colleagues published a study of non-fractal star drawings and claimed that fractal analysis is flawed because their analysis falsely identified the stars as fractal (Nature, vol. 444, E9-10, 2006). In their rebuttal, Taylor’s group performed their own fractal analysis on the star patterns and showed that the stars were, in fact, not fractal (Nature, vol. 444, E10-11, 2006). Taylor reported further flaws in Jones-Smith’s analysis. Fractals expert Lansaros Gallos summed up: “What Jones-Smith has done is just a simple trick – this is bad science about fractals.” (ScienceNews, vol. 171, 122, 2007) Jones-Smith raised one valid issue: whether Pollock’s patterns occur over enough magnifications to be called fractal. However, she admitted she was at odds with the research community. She would have to dismiss half of all the investigations of fractals ever published based on this concern. Benoit Mandelbrot, inventor of the term fractal, summarized: “I do believe Pollocks are fractal.” (ScienceNews, vol. 171, 122, 2007). 2007: Jones-Smith and colleagues announced to the press that they had submitted a study of poured paintings to the journal Physical Review Letters. The study showed that their fractal analysis could not distinguish between Pollock and non-Pollock paintings. Physical Review Letters rejected the submission. Computer scientist Hany Farid commented: “I think they [Jones-Smith et al] took a fairly simplistic way of separating those colors [of paint] which could have skewed their results.” The study served as a useful warning: the success rate of fractal analysis in detecting fakes is sensitive to factors such as image quality of the paintings and the image processing techniques used. http://www.scientificamerican.com/article.cfm?id=can-fractals-spot-genuine. 2007-8: Three groups (led by psychologist Christoph Redies, psychologist David Field and computer scientist Jose Alvarez-Ramirez) independently quantified Pollock’s fractals using a Fourier transform technique (Spatial Vision, vol. 21, 97-117, 2007, Spatial Vision, vol. 21, 137-148, 2007, Journal of Spatial Vision, vol. 21, 149-164, 2007, Perception, vol. 37, 1341-1352, 2008, Physica A, vol. 387, 281-295, 2008). 2009: Jones-Smith and colleagues’ 2007 fractal analysis of poured paintings was eventually accepted for publication (Physical Review E, vol. 79, 046111, 2009). In his own publications on Pollock’s fractals, computer scientist David Stork described Jones-Smith’s publication as: “a failure to follow well-established principles and methodologies from statistical pattern recognition” (SPIE Electronic Imaging: Machine Vision Applications II, vol. 7251, 72510Q1–11 2009 and SPIE Proceedings on Computer Vision and Image Analysis of Art II, vol. 7869, 78690H, 2009). He also recommended combining fractal analysis with other pattern analysis techniques to increase its detection capabilities. 2011: Taylor and neuroscience collaborators developed a “fractal fluency” model for how observers view Pollock’s fractals. The results demonstrated that Pollock’s patterns span sufficient magnifications to strongly display the visual character of fractals (Frontiers in Human Neuroscience, vol. 5, 1- 13, 2011 and Fractal Geometry of the Brain, Springer, 2016). 2011: Cernuschi’s group employed non-linear physics to examine Pollock’s pouring technique (Physics Today, June edition, 31-36, 2011). After fifty years of debate, the answer to Modern Art’s greatest puzzle was delivered from an unexpected source – science. In 1999, Richard Taylor and his research team published the results of their scientific analysis showing Pollock’s poured patterns to be fractal. Consisting of patterns that recur at increasingly fine magnifications, fractals are the basic building blocks of nature’s scenery. Labelled as “Fractal Expressionism,” Pollock distilled the essence of natural scenery and expressed it on his canvases with an unmatched directness. By adopting nature’s pattern generation processes, the resulting paintings didn’t mimic nature but instead stood as examples of nature. The above images compare Pollock’s fractals to those found in nature. Remarkably, the analysis revealed a highly systematic fractal painting process perfected by Pollock over a decade. Since this discovery, the continuing research on Pollock’s fractals by Taylor’s group and others has been greeted with considerable enthusiasm from the press, the public, and the scientific and artistic communities. Inevitably, there’s also a lot of misinformation about Pollock’s fractals on the Internet. Click here for the facts. 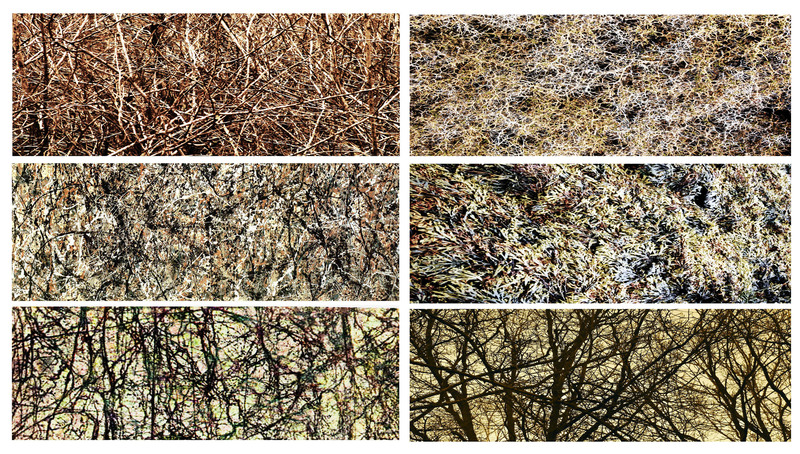 **Answer key (starting top left and going clockwise): a bush, vegetation, seaweed, trees, spiders web, Pollock! Diseased regions of the retina (a) can be replaced by electronic implants which convert light into electrical signals (b). The surface of our implants feature fractal electronics (c) which match the shape of the fractal neurons (d) that they pass their signals to. Designed to enhance communication with neurons, our fractal electronics are radically different to traditional electronics (e). Imagine a world in which damaged parts of the body – an arm, an eye, or even a region of the brain – can be replaced by artificial implants capable of restoring or even enhancing human performance. The associated improvements in the quality of life would revolutionize the medical world and produce sweeping changes across society. This imagined world can be brought into reality by optimizing the fundamental science at the interface between the artificial and biological systems. In this project, we simulate, fabricate and test a novel electronic-nerve interface. Our bio-inspired ‘interconnects’ have the same geometry as the nerves they interface with. This will radically improve electrical stimulation of nerves in the human retina, allowing victims of retinal diseases to see in greater detail and under more realistic lighting conditions compared to retinal implants using conventional interconnects. Implants using our interconnects will also be capable of color vision. The ultimate aim is to restore vision to the point that recipients can read text and facial expressions – crucial capabilities for functioning in society. The retinal implant project started in 2014 when Taylor’s research group won an InnoCentive Prize, beating over 950 competing ideas. This was followed by two invitations to the White House and a $1.8M award from the W.M. Keck Foundation and the University of Oregon. The technology was patented in 2015. The project features 5 faculty members (Richard Taylor, Miriam Deutsch, Benjamin Aleman, Darren Johnson, Cris Niell) and 8 graduate students from the Physics, Chemistry and Biology Departments. Computer simulations (left image) quantify the successful transfer of signals from our implant to the neurons. Three-dimensional images of neurons (middle image) allow us to build implants that match their fractal shapes. A scanning electron microscope image shows a retinal neuron (purple) adhering to the textured surface of our implant (right image). Artificial Retinas Project. Richard Taylor, head of the Artificial Retinas Project, discusses project research. Movie produced by Matt Alpert. Fractal Interconnects for neuro-electronic interfaces and implants using same, Patent awarded July 2015. Nanoelectronic devices approach one billionth of a meter in size (50,000 times smaller than a human hair). Smaller than today’s commercial devices and made from purer materials, nano-devices are expected to revolutionize the technologies that underpin society.Ballistic nanoelectronic devices are made from materials so pure that the electrical current travels through the solid much like bullets fly through the air! Although impurities in the material are minimized in these devices, they have a profound effect on device performance. My research investigates how impurities induce chaos in the electricity by scattering the flow of electrons in the current. This chaotic scattering causes the electricity to flow along fractal patterns through the devices, much like a river splitting into fractal tributaries. Intriguingly, quantum mechanics allows the electrons to behave both like waves and particles, resulting in the highly topical phenomenon ‘quantum chaos’. My research of quantum chaos and the resulting fractal electricity is aimed at understanding the basic principles of electricity at the nano-scale and also how to exploit this novel behavior to produce faster and more powerful electronic devices.Given that electricity wants to flow along fractal pathways, we are building devices that connect together to form fractal shapes. These fractal circuits are constructed using two “self-assembly” growth processes: one process deposits gold nanoparticles onto tangled DNA strands, the other grows ‘nanoflower’ circuits from nanoclusters (see left image). Self-assembly represents an efficient and ‘green’ approach to constructing devices. In addition to novel fractal transistors and sensors, we are developing fractals circuits for human implants and solar cells. In each case, we use the principle of biomimicry to exploit the functionality of nature’s fractals to provide technological advances. The fractal circuits are ideal for bioeletronics because they mimic the neurons they are designed to stimulate and measure. They also replicate the light-harvesting properties of fractal trees for the solar cells. These two projects represent the most important targets for future physics research – safeguarding human health and the Earth’s environment. For example, fractal electronics could address neurological disorders such as Parkinson’s disease and depression, and also improve nerve connections to prosthetic limbs. Fractal Vision: (Left) The red trajectory shows the fractal motion of the eye as the observer looks at one of Jackson Pollock’s fractal paintings. (Right) A fMRI scan shows the region of the brain that are activated when viewing a fractal pattern. I lead an interdisciplinary research network that investigates the positive physiological changes that occur in people when they look at fractal patterns. The experiments – which use eye-tracking equipment to examine how people look at the patterns, and qEEG and fMRI probing techniques to quantify the resulting brain activity – indicate that people are ‘hard-wired’ to respond to a specific form of fractal found in nature, one that reduces stress levels by up to 60%. This stress-reduction is triggered by a physiological resonance that occurs when the fractal structure of the visual system matches that of the fractal image being viewed. Our discovery that exposure to fractals automatically relaxes people holds crucial implications for society: the U.S. spends over $300 billion annually on stress-induced illnesses, and stress is increasingly blamed for precipitating debilitating disorders such as schizophrenia. As society increasingly surrounds itself with urban landscapes, people risk disconnecting from this natural stress-reducer. Accordingly, my group investigates people’s responses to paintings created by artists famous for capturing the essence of nature on their canvases. For example, the positive physiological responses of viewing Jackson Pollock’s poured paintings and Mauk Escher’s tessellations might explain their enduring popularity. The long-term goal is to collaborate with artists and architects to incorporate stress-reducing fractals into novel indoor and outdoor environments. These ‘biophilic’ fractals could be used in many applications, ranging from keeping astronauts calm on their long journeys into space to soothing anxious patients in dentist waiting rooms.